Umbilical cord blood belongs to the baby not only before birth but also immediately after birth. The baby is NOT to be depleted of this blood needed for circulation to the lungs after birth. Parents and researchers may preserve what is left ONLY after the baby has taken what he/she needs. Cord blood banks are expanding without factual information as to the true merits of this new research. Hence, many couples are falling prey of an emerging multi-million dollar business. Life on earth is a continuum from conception until true death. Life of the human person manifests the intrinsic unity of the soul and body. God picks out the mother and the father for this new creation. The child receives his/her genetic makeup from his mother and father. Early life is spent within his/her private intrauterine environment, the amniotic fluid, which is made wholly and entirely by the infant himself/herself. 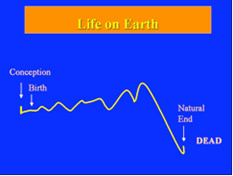 Life on earth after birth depends on whatever happens before and during birth. Large amount of blood in the umbilical cord and placenta are needed for the volume of blood necessary for the increased blood flow to the baby's lungs after birth. The rest of life depends on whatever happens before and during birth. We are expressing and emphasizing that large volumes of blood are in the umbilical cord and placenta required for circulation immediately after birth, especially to the lungs. Umbilical cord blood belongs to the baby and ought not to be stolen by those who wish to use the umbilical cord blood for experimentation. The lungs before birth are organs of secretion. 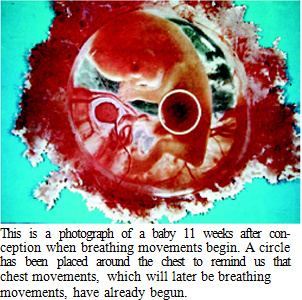 The movements of the chest push the lung fluid into the amniotic fluid. At birth the lungs must stop producing fluid and become an organ of absorption. Then air enters the lungs for them to become an organ of respiration. Pulmonary resistance decreases and pulmonary blood flow increases. The volume of blood needed for this increased pulmonary flow comes from the blood in the umbilical cord, unless the cord is clamped immediately to get blood to save for stem cells. When the cord has been clamped immediately and short, the circulation very likely is "robbed." Umbilical cord blood belongs to the baby. The baby belongs to God. The baby's parents must be informed of all this so they can responsibly protect and preserve the life of their baby given to them by God. 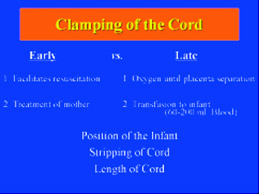 Delayed clamping of the cord or clamping it as far away from the baby as possible allows a natural transfusion of 60 to 200mL of blood into the infant. This is equivalent to 1 to 2 transfusion units of blood for an adult. This photograph is a bit out of focus, but it shows the umbilical cord full of blood at the time of birth. This is a photograph shortly after birth showing the umbilical cord partially emptied. Here we can appreciate that more of the blood has gone into the baby but there is still blood remaining in the cord. Ob-serve the contrast of the emptied cord compared to the short clamped segment. 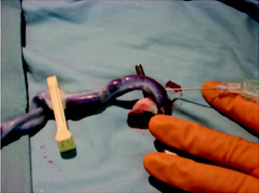 Another photograph of a baby showing the umbilical cord after the baby has taken in his blood compared to the clamped segment that is still full of blood. 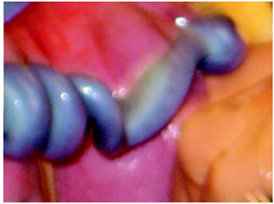 This close-up photograph shows the same baby and contrasting segments of umbilical cord. In this one we can observe that blood can still be withdrawn from the umbilical cord even after the infant has been allowed to receive his/her own blood that is needed for circulation to the lungs after birth. The photograph shows a happy pink baby who would say, "As I enter my new world, thank you for leaving my cord long and allowing me to have my blood that is needed to fill my lungs to prevent respiratory distress, persistent fetal circulation, cerebral hypoxia, intraventricular hemorrhage, anemia, and possibly autism." It is essential that a dynamic thought process is in effect when treating and caring for an infant. Antepartum information must be obtained and evaluated. Results of fetal monitoring, especially repeated occurrences of abnormal fetal heart rate, presence of meconium in the amniotic fluid, especially in the asphyxiated infant requires immediately after birth suction of the mouth and then the nose. Here again, leaving the infant with a long cord and allowing time for the blood to go into the baby is essential. The cord must not be milked into the baby of toward the placenta. The infant is evaluated at birth including Apgar scores. No one should consider taking blood for stem cells until the baby has completely adapted to extrauterine respiration and circulation. ACOG Committee on Obstetric Practice. ACOG Committee Opinion No 348, November 2006: Umbilical cord blood gas and acid-base analysis. Obstet Gynecol. 2006 Nov; 108 (5) :1319- 22. Baenziger O, Stolkin F, Keel M, von Siebenthal K, Fauchere JC, Das Kundu S, Dietz V, Bucher HU, Wolf M. The influence of the timing of cord clamping on postnatal cerebral oxygenation in preterm neonates: a randomized, controlled trial. Pediatrics. 2007 Mar;119(3):455-9. Chaparro CM, Neufeld LM, Tena Alavez G, Eguia-Líz Cedillo R, Dewey KG. Effect of timing of umbilical cord clamping on iron status in Mexican infants: a randomised controlled trial. Lancet. 2006 Jun 17; 367 (9527) :1997-2004. Hutton EK, Hassan ES. Late vs early clamping of the umbilical cord in full-term neonates: systematic review and meta-analysis of controlled trials. JAMA. 2007 Mar 21; 297 (11) : 124 1-52. Mercer JS, Vohr BR, McGrath MM, Padbury JF, Wallach M, Oh W. Delayed cord clamping in very preterm infants reduces the incidence of intraventricular hemorrhage and late-onset sep-sis: a randomized, controlled trial. Pediatrics. 2006 Apr; 117 (4) :1235-42. Mercer JS, McGrath MM, Hensman A, Silver H, Oh W. Immediate and delayed cord clamping in infants born between 24 and 32 weeks: a pilot randomized controlled trial. J Perinatol. 2003 Sep; 23 (6) :466-72. 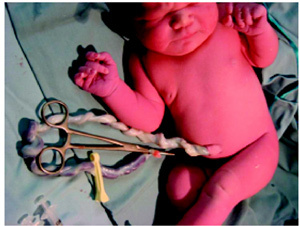 Oh W. Timing of umbilical cord clamping at birth in full-term infants. JAMA. 2007 Mar 21; 297 (11) :1257-8. Rabe H, Reynolds G, Diaz-Rossello J. 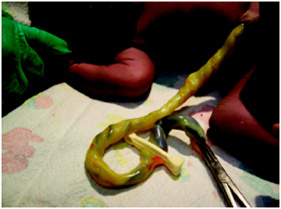 Early versus delayed umbilical cord clamping in preterm infants. Cochrane Database Syst Rev. 2004 Oct 18;(4):CD003248.